How do I begin to write the story of my childhood sexual abuse, how do I find the words to explain the indescribable situation my eight-year-old self-adapted to and compartmentalised at such a young age. Why was I compelled to write the ugliness of what happened to me? Shouldn’t I have left it silently awake at the back of my mind behind blue eyes and curls that never gave away my secret? My childhood diaries were the beginning. The first place my pain was splattered as cryptic word’s written on to a page. I was trying to unwrap what was happening to me without being too descriptive but over time my diaries became brutal and graphic. They were the normal/not normal Dear Diary of a teenager, a sad, dark tale interspersed with movies and friends. Writing has always been a relief, words helped me when I was too afraid to express my feelings, it was essential to my survival. I felt compelled to tell my story at a time in my life when I was finally living so differently from my childhood. I had a professional career as an actress and was happily married. I had been living and loving well for so many years that I no longer felt the need to hide my past. No longer did I want to disguise myself inside stories of other people. The words I wrote needed to be mine. I left my acting career to write. I needed to go back to the child in me and fearlessly tell my story. I tapped into the girl inside and wrote each chapter in the ages that the abuse took place. Once I opened my Pandora’s Box there was no stopping the indescribable being told. I took long breaks to be a woman, to enjoy the superficial in life, manicures, pedicures and facials. I found space to stop being the child. My husband, my constant best friend, listened to what I had written every weekend, giving me an outlet so that I could leave it behind on the page and move on. On to the next sentence, the next paragraph, the next chapter, and eventually the end of the book. It was essential for me to write only about the abuse and not about the years after. The upheaval that happens to a child when they are being sexually abused is beyond belief and I wanted to emphasise this. The mental, physical and sexual devastation of my childhood needed a place to sit alone, stark and as naked as I was forced to be as a child. When I started writing I wanted to use my diaries as a reference, to make sure my story was sitting in constant truth but I never found them. Jonathan and I had moved house and they were in a box somewhere. Only once I had finished the book did we find the mysterious missing box. I believe it was meant to be, that the re-discovery of my childhood needed to come from inside me. Eventually, when I did read my diaries it was uncanny how similar my writing style was and how the memory of what happened to me was as sharp as if it was yesterday. It left me with such sadness after reading them but also so much love for the girl me. How lucky I am to have moved forward into womanhood without being psychologically imprisoned because of what my stepfather did. I’m often told that I was brave to have written indescribable but that’s not true. What I felt was brave was my desire to enjoy life at such a young age and wanting ‘good’ love so much more than spiralling into the cruel attraction of darkness. I was an outgoing yet introspective teenager trying hard to find my way and eventually, I started doing well enough despite what had happened to me. I started to thrive. My book was born out of a feeling that I was no longer walking internally fractured. If I had written Indescribable in pain it would have been a very different book. Ending the book, releasing it into the hands of the readers was terrifying but also liberating because it was a story I felt strongly needed to be told in the way that I told it. It helped me to let go further and see how far I had actually come. 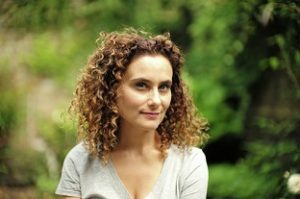 Candice Derman is a renowned South African actress who launched her career as a TV host and later became a household name for her roles in South African soaps. Candice now lives in London with her husband and daughter. 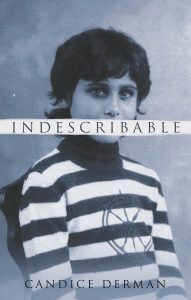 Told entirely from the perspective of her childhood self, Indescribable explores South African actress Candice Derman’s traumatic past, opening our eyes to the complexities of sexual abuse and how easy it can be for such a secret to go unseen. First published in South Africa in 2010 to critical and commercial acclaim, this book gives important insight into the mind of a sexual abuse victim and should be compulsory reading worldwide.